Courtesy DYLAN BUELL BALL STATE DAILY NEWS Junior running back Bernard Pierce stiff arms Ball State freshman safety Brian Jones in the Owls’ 42-0 rout last Saturday. Pierce set a school record for career rushing touchdowns (41). 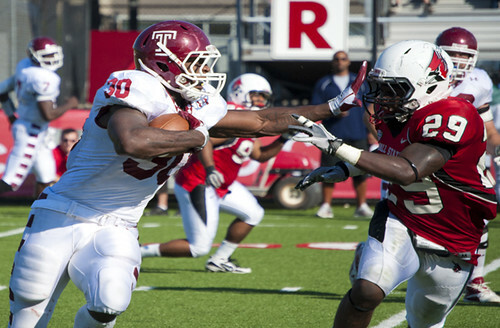 Junior running back Bernard Pierce led the Owls with three touchdowns. When the Owls traveled to play Ball State (3-3, 1-1 Mid-American Conference) in Muncie, Ind. last Saturday, they packed their running game on their way to a 42-0 win. The Owls entered the game with the nation’s 22nd best rushing offense, averaging nearly 210 yards per game, while its 109th ranked passing game was averaging about 160 yards per game. The Owls’ Ball State stat sheet totaled 350 rushing yards and 160 passing yards for a total of 510 yards of offense compared to its opponents’ 236 total offensive yards. Coming off a 36-13 loss to Toledo the previous week, the Cherry and White (4-2, 2-1 MAC) offense ran the ball 62 times compared to its 13 passing attempts. One difference between the Owls’ game against the Rockets and its blowout win with the Cardinals was the team’s success at running the ball. Scoring three touchdowns on the day, Pierce became the program’s all-time leader in rushing touchdowns. He passed Paul Palmer (1983-86), who held the record for approximately 25 years with 39 touchdowns. Pierce said in a press conference after the Toledo game last week that the team played “lackadaisical” and that it didn’t have a drive or a focus while playing. Addazio added that being down against the Rockets caused the game plan to change into a more pass-conscious offense. In the Owls’ first MAC game, Pierce netted 75 rushing yards on 24 attempts and failed to find the endzone for the first time this year against the Rockets. But the Ardmore native turned in his second-highest number of rushing attempts against the Cardinals, 30, while averaging four yards per carry for a total of 121 yards with three scores. Part of the offensive turnaround was due to the mix of run and pass plays to begin the game. Six of redshirt-senior quarterback Chester Stewart’s 13 passing attempts came in the offense’s first series, including four completions. “I thought the defense played really strong, but I think the offense ball control kept them off the field, which is what I knew we needed to do,” Addazio said. Stewart, who went 10-13 for 160 yards, completed a touchdown pass to senior wide receiver Joe Jones for 24 yards on the opening drive to put the Owls up 7-0. However, the next five scores for the Owls in the game would be rushing touchdowns. On the second drive of the game, the Owls came out running the ball, as Pierce had two consecutive rushes for two yards each time. Stewart completed a pass to Jones on third down to pick up the first down and following the play hit senior wide receiver Rod Streater for a 42-yard completion to the two-yard line. Then Pierce rushed the ball and found the endzone for his first score of the game. On the Owls’ third drive, the offense called one passing play compared to the 13 rushing attempts in the series. Three different players ran the ball in the drive, as Stewart, Pierce and junior running back Matt Brown each took turns carrying the football. Redshirt-sophomore Chris Coyer entered the game in the fourth quarter with the score at 35-0 and after two rushes from freshman running back Kenny Harper, Coyer took off on a 74-yard run to score the game’s final touchdown. It would be Coyer’s lone rushing attempt, while Harper, Stewart, Brown, and junior running back Darius Johnson tallied seven, 24, 114, and 13 total rushing yards, respectively, in the game. The Owls also entered the game with the No. 10 scoring defense (13.40 points allowed per game) and sack (3.00 per game) producing team in the country. The Cardinals came into the game averaging about 23 points and a nation’s 16th lowest sacks allowed per game at 0.80. But the Cherry and White defense cut into its opponent’s stats by not allowing any red-zone scoring chances and sacking the Cardinals’ sophomore quarterback Keith Wenning three times. Owls’ junior defensive backs Vaughn Carraway and Justin Gildea each recorded an interception as well. “We just want to enjoy this win. We don’t want to over enjoy it like how we did Maryland and comeback not ready to play,” Stewart said. At 1 p.m. on Saturday, Oct. 15 at Lincoln Financial Field the Owls will take on Buffalo (2-4, 1-1 MAC) for a Homecoming game. Buffalo narrowly defeated Ohio (4-2, 1-1 MAC) 38-37 on Saturday.